Make Your Own Scrambled Pictures / Words - 1 NEW! Perfect for first-time or beginners. No matching. This worksheet generator uses five drop-down menus of sight words and displays the corresponding pictures. On the right, the letters of the words are scrambled and correspond with the pictures, First unscramble the words and then write the word on the line below. The generated worksheet can be used to practice either Manuscript or Cursive handwriting. See example worksheet on the right. Make Your Own Scrambled Pictures / Words - 2 NEW! This worksheet generator uses five drop-down menus of sight words and displays the corresponding pictures. The words are scrambled and they are out of sequence with the pictures, First unscramble the words and then write the word on the line below. Draw a line to match the picture and the word. The generated worksheet can be used to practice either Manuscript or Cursive handwriting. See example worksheet on the right. Make Your Own Scrambled Words - NEW! Enter your own words, it will automatically scramble the words for you and create a printable worksheet. A minimum of five (5) words, maximum of twenty (20) words per worksheet. * Special Occasions: Holidays, Birthdays, etc. Draw and write your journal. 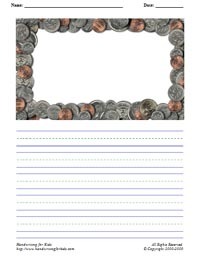 A great way for kids to begin their creative writing in their journals. You can choose your journal styles: Color borders, Spring, Butterflies, and Coins by country (Australia, Canada, Mexico, United Kingdom, and United States). See US-Coins sample on the right.